The Understanding Risk in Shared CyberEcosystems workshop convened Saturday, November 11 through Thursday, November 16, 2017 in Denver, Colorado. In addition to 12 hours of cybersecurity training, URISC participants attended SC17; the flagship high performance computing (HPC) industry conference and technology showcase that attracts more than 10,000 international attendees each year. A STEM-Trek call for participation closed Sept. 11. 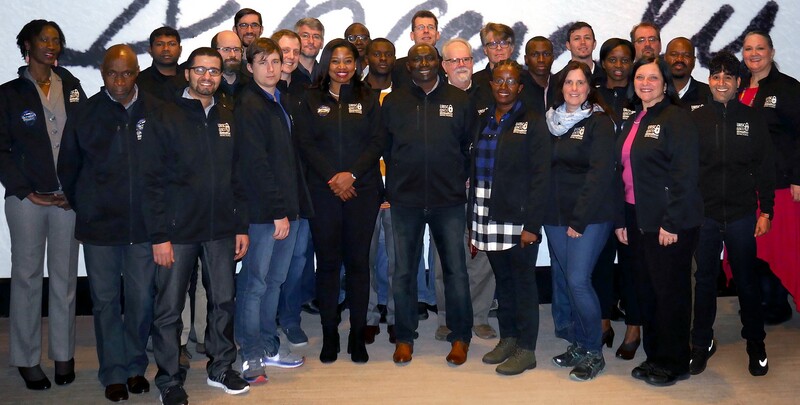 Applications were accepted from cybersecurity professionals, HPC systems administrators, educators and network engineers who support research computing at US and sub-Saharan African colleges and universities in under-served regions. All serve in professional support roles at least 50 percent of the time where they help students, faculty and staff leverage locally-hosted, or remotely-accessed advanced cyberinfrastructure (CI) for education and open research. US applications were reviewed and ranked by African reviewers, and vice versa. Thirty percent of African applications were received from women, and 80 percent of the pool reflects demographics that are typically under-represented in cybersecurity and HPC careers. Thirty-percent of applicants were awarded grants which cover flights, lodging, ground transit and some meals; international scholars received U.S. pocket-money. Every effort was made to shape the diversity of the final cohort so it mirrored the applicant pool in terms of gender, ethnicity, research domains, and regions represented, and the same consideration was applied when choosing presenters. Eight US participants are XSEDE Campus Champions (six were supported by the project, and two were self-funded), and five are from EPSCoR states (NSF Established Program to Stimulate Competitive Research). Special guests from Nepal (ICIMOD) and Canada (U-BC) were invited to attend; altogether, 34 URISC delegates, trainers and guests represented 11 countries and 12 US states. An introduction to open-source materials developed by the Center for Trustworthy Scientific Cyberinfrastructure (CTSC) was shared, as well as coaching in the art of external relations – specifically how to foster administrative and legislative buy-in for a greater cybersecurity investment on college campuses. The agenda was customized to consider what has become an increasingly diverse body of campus stakeholders—including researchers, students, faculty, government agency stakeholders, “long-tail” user communities, and regional industry partners. 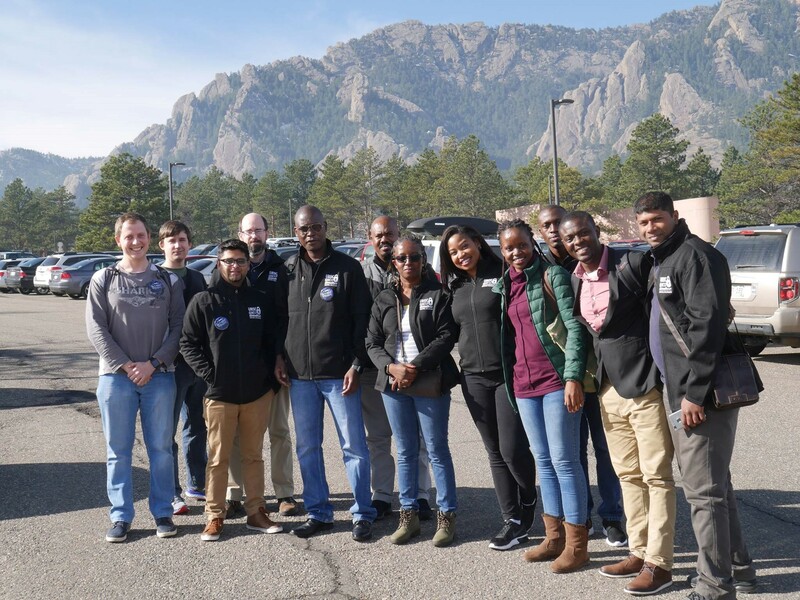 On Friday, Nov. 10, a smaller delegation from the US, pan-African nations, Canada and Nepal visited the National Center for Atmospheric Research (NCAR) in Boulder. They toured NCAR’s visualization lab and cybersecurity center, and met researchers who lead a variety of global climate and environmental projects. Meshack Ndala (Cybersecurity Lead, CHPC, Cape Town), URISC Trainer, SME. Susan Ramsey (NCAR): “The Anatomy of a Breach.” See recap of Susan’s presentation. Thomas Sterling (Indiana University, CREST): Sterling will share highlights of a new NSF-funded course titled, “High Performance Computing: Modern Systems and Practices, first edition,” scheduled for release Dec. 2017. Happy Sithole (Director, South African Centre for HPC): Sithole will provide a brief welcome, and overview of technology initiatives supported by the CHPC. For more than 50 years, HPC has supported tremendous advances in all areas of science. Densely-populated, urban communities can more easily support subscription-based commodity networks and energy infrastructure that make it more affordable for nearby universities to engage with globally-collaborative science. Conversely, research centers that are located in sparsely-populated regions are disadvantaged since their last mile is much longer; there are fewer partners with which to cost-share regional connectivity. It’s more difficult for them to recruit and retain skilled personnel, they must travel longer distances to attend workshops and conferences, and it’s tougher to buy new hardware and software; there are many more competing priorities for limited funds, and they receive less federal grant support. At the same time, they represent industrial landscapes that reflect globally-significant environmental factors, rich biodiversity, geology, and minerals. Every place on earth has a unique perspective of our universe, and less-populated regions offer the most detailed and unfettered vantage points. When researchers everywhere can access data that are generated by and stored at these sites, progress will be accelerated toward solutions to problems that impact global climate, environment, food and water security, public health, quality of life, and world peace. While every HPC professional would benefit from attending the annual Supercomputing Conference, few from the communities STEM-Trek helps could afford to attend otherwise. Many are campus “tech generalists” who must balance administrative, support and teaching obligations; it’s more difficult for them to take time away from work because skill sets are usually one-deep (there is no back-up to mitigate the many crises that arise when centers function with inadequate and/or aging e-infrastructure). Because they wear both sysadmin and trainer hats, they rely on student labor to support their HPC resources. Their students learn more, and make an exponentially larger and more meaningful contribution to the global HPC workforce pipeline. Even if they could take time away from work, they can’t afford to; in many cases, state and federal travel budgets have been legislatively restricted or eliminated altogether. Some of the countries that will be represented at URISC have consumer prices that are 80 and 90 percent lower than they are in the US and Europe where such conferences are typically held. This is also why they’re disadvantaged when it comes to purchasing new hardware, and why we encourage more affluent universities and government labs to donate decommissioned hardware so its life can be extended for another five to seven years in a light research and training capacity. Despite these barriers, URISC attendance is easier to justify since participants will not only learn cybersecurity best practices from some of the world’s most informed specialists, they will become part of a multinational “affinity” network which offers a psycho-social framework of support for the future, and access a wealth of information at SC17. This workshop is supported by US National Science Foundation grants managed by Indiana University and Oklahoma State University, with STEM-Trek donations from Google, Corelight, and SC17 General Chair Bernd Mohr (Jülich Supercomputing Centre) with support from Inclusivity Chair Toni Collis (U-Edinburgh). This will be the third year that STEM-Trek has been involved with an SC co-located workshop for African stakeholders, and the second year for US campus technology facilitators. In 2015, a workshop was arranged by the Texas Advanced Computing Center at TACC in Austin, Texas co-facilitated by Melyssa Fratkin (TACC) and Elizabeth Leake (STEM-Trek). Last year’s “HPC On Common Ground @SC16” workshop in Salt Lake City featured a food security theme and was led by Elizabeth Leake (STEM-Trek), Dana Brunson (Oklahoma State University), Henry Neeman (University of Oklahoma), Bryan Johnston (South African Centre for High Performance Computing/CHPC) and Israel Tshililo (CHPC). The SADC HPC Forum formed in 2013 when the University of Texas donated their decommissioned, NSF-sponsored Ranger system to the South African CHPC. Twenty-five Ranger racks were divided into ten smaller clusters and were installed in universities in the SADC region. It is their goal to develop a shared cyberecosystem for open science. In 2016, a second system was donated by the University of Cambridge, UK. It was also split into small clusters that were installed in Madagascar and South Africa (North-West University). In 2017, Ghana joined the collaboration and CHPC installed a cluster there that will become part of the shared SADC cyberecosystem. 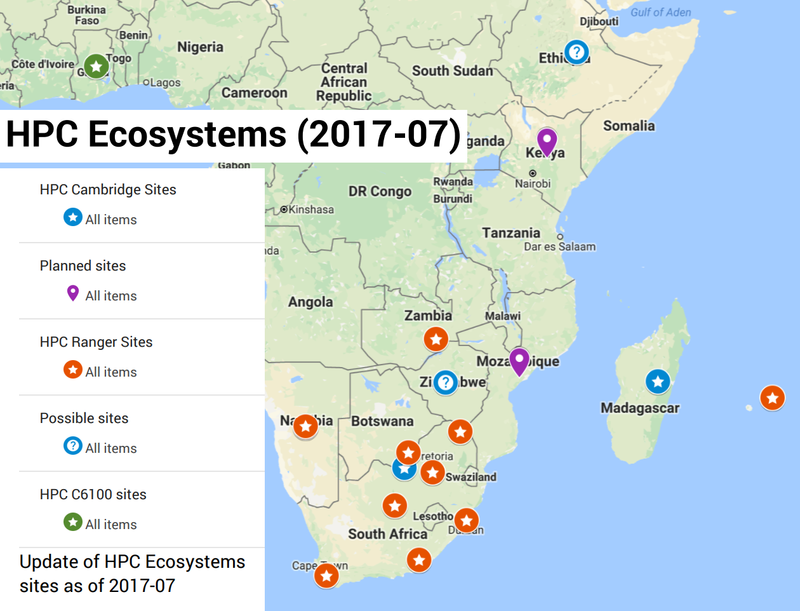 The CHPC continues to lead training efforts in the region, and a dozen or so US and European HPC industry experts volunteer to advise as the shared African CI project continues to gain traction. Many SADC delegates have trained as a cohort since 2013, and it has been a successful exercise in science diplomacy. Among them are network engineers, sysadmins, educators, computational, and domain scientists. While there are multiple language and other cultural disparities, as they train together with a common goal, the team has coalesced despite these differences. They are creating a procedural framework for human capital development, open science and research computing. The SADC HPC Forum serves to inform policy-makers who will then advocate for greater national investments in CI. The SKA project – the most ambitious and well-funded technology project ever developed – is being installed in the “radio quiet” Karoo region of South Africa. SKA is contributing computational and data science training (and resources) to SADC HPC Forum participant schools to help prepare the indigenous workforce pipeline needed to support the SKA’s 50-year lifespan. Additionally, they’re investing in peered national research and education networks that will ultimately support a shared CI.